We went to see Sigur Ros at the Eden Project on Sunday night. One of my favorite bands in one of my favorite places. If you haven’t come across them they create epic soundscapes evoking the ice and fire of their Icelandic homeland. Beautiful, emotionally saturated grandeur. A huge dynamic range encompassing tinkly percussion and the sound of a guitar played with a bow and overdriven until its as big as a glacier. A searing mountainous backdrop to Jonsi’s ethereal falsetto. You can see my photos on flickr here. Sigur Ros were brilliant, the setting was intimate and magnificent, and the lights were magical. But the audience diminished the experience for me. Maybe we stood in the wrong place, but there was a constant flow of people marching past us to get to the bar. And lots of chatter. We moved after a while when the irritation got too much, and escaped some of the traffic. I don’t get it though. Why go to the expense and effort of going to a live gig and become preoccupied with beer and conversation in the midst of such epic music? What is wrong with attentiveness? In this ultra-fast super-connected culture have we forgotten how to pay attention? 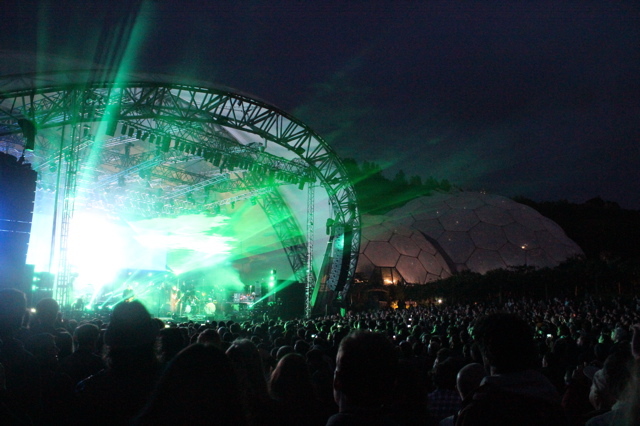 This entry was posted in Music, photography and tagged Eden Project, Sigur Ros by iaincotton. Bookmark the permalink.